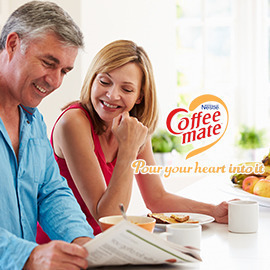 Invent a new generation of Nestlé Coffee-mate products for existing coffee creamer consumers. In the world, people drink 1000 billion cups of coffee. 60% of the cups are not consumed as black coffee. People add milk, cream or creamer to their cups. It’s called “white” coffee, it enhances the taste, appearance and mouthfeel (texture) of the coffee experience. To whiten their coffee, people use mostly milk, also creamers (coffee whitening specific products), and coffee mixes (coffee+powder creamer+sugar); recently plant based alternatives such as soy or almond milk have been increasing in popularity as well. Help us re-invent Nestlé Coffee-mate to delight people who do like creamers and Nestlé Coffee-mate. Format: 1 page including your visual and some explanations. Entries are only accepted till May 29, 2016 23:59 UTC!